Fresenius Kabi, a global health care company based in Germany, hosted a topping off ceremony last week to celebrate the $100 million expansion of its pharmaceutical manufacturing campus in Wilson, North Carolina. 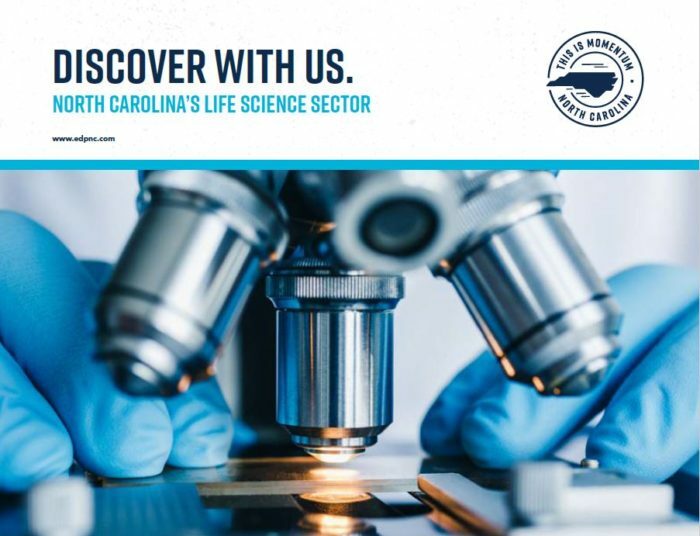 Download our brochure on all that North Carolina offers life science companies. The North Carolina Biotechnology Center provided technical support for the corporate expansion, in partnership with the North Carolina Department of Commerce and the Economic Development Partnership of North Carolina. Other partners included the North Carolina General Assembly, the North Carolina Community College System, Wilson County, the city of Wilson, and the Wilson Economic Development Council. The company broke ground in September 2017 on a $250 million expansion at its pharmaceutical manufacturing site in Melrose Park, Ill. In total, the company employs more than 3,000 people in the U.S., including at its U.S. headquarters in Lake Zurich, Illinois. This article by Wyatt Corbett, writer for the North Carolina Biotechnology Center, originally appeared on the on the NC Biotech Center website here. NC Biotech Center website. The North Carolina Biotechnology Center is a private, nonprofit corporation supported by the North Carolina General Assembly. The center’s loans, grants, programs and activities develop strengths that yield transformational partnerships and life science jobs statewide. Interested in locating or growing your business in North Carolina? Email EDPNC’s business recruitment team or call us at 919-447-7744.